A couple days a go, I had the opportunity to meet up with Mike Taylor, owner of In the Bag Corporate Cuisine. As a foodster, I was very intrigued about how he came up with the business, and you know, what the biggest difference between the sandwich guy across town and ITB was. Of course it’s always providing the best and highest quality meal but there is a little bit more to that with In the Bag. I got that it’s all about the experience and making that person enjoy their sandwich, while at the same time, adding fun to their day with little trinkets that they put in the bags. For instance, Mike will put little rubber ducks in the the bag, along with an inspirational quote. It’s the little things that can make a day, and he makes sure that each person is having a great day. It’s incredible what he gives back to the community, too. If you were to read through the newsletters on the website you might forget that there are sandwiches going out with bags filled with toys, and other little things that can fill your day with joy – it’s all about the little things in life, right? In the Bag, and Mike, himself, are huge into giving back to the community and giving you happiness. There is always some cause that is being highlighted. I was able to get a tour of his building that is home to the famous brownies and great sandwiches. I was amazed at the size of the place. This aint your little deli with a couple of delivery trucks – it’s a warehouse that is ready to feed thousands of hungry Des Moines Foodsters. He has it organized very well. Each aspect of his business has their own room. I think it’s a great way to spread it out and utilize the space. Along with lots of rooms, and space, there is a massive garage that holds some delivery cars, and some big fridges. He plans to expand the bag prep area into the garage for a better work flow. For all of you Pinterest fans with your ‘home’ boards, this house is everything from Pinterest and more. Here are some Facebook photos for you to see this retreat http://on.fb.me/SzpFwF. Mike rents the house out for half and full days to companies and individuals to relax and enjoy the view of the Des Moines River and spot a bald eagle once in a while. I’m so grateful of the opportunity I had to meet with Mike Taylor. 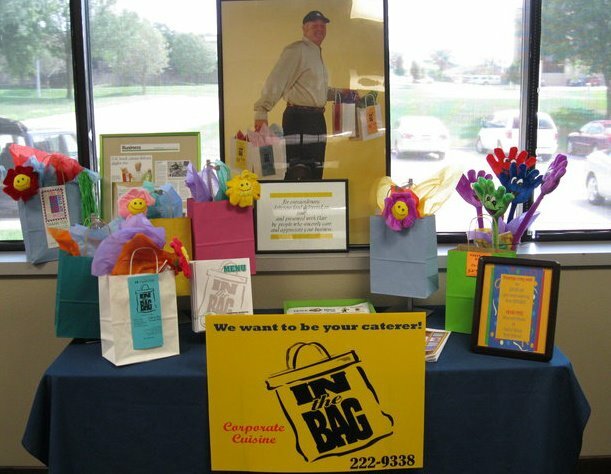 Next time your business needs a catered lunch, give Mike at In The Bag a call!